From an early age it was evident that Eric had artistic talents and at the age of 10 he won an art competition "Why I love living in the Wyoming Valley" that included students from all of the surrounding schools and his drawing of the Swetland Homestead was exhibited in the Franklin First Federal Building in downtown Wilkes Barre. His talents continued to win him numerous competitions and in 1990 he was awarded for his Contribution to the Arts by Wilkes University where he attended their Upward Bound program. In 1991, Eric attended Pennsylvania State University, where he earned a B. F. A. in painting, with and a minor in an art history focusing on Baroque art. In 1995 he received the Margaret Giffen Shoenfelder Memorial Scholarship for the Arts and finished his art history minor abroad for a semester in Todi, Italy. During his art classes where he drew from original paintings, architecture and sculptures by the old masters such as Michaelangelo, Bernini, Caravaggio, Rubens and Donatello. The rare opportunity to study masterworks by Baroque painters Caravaggio and Artemisia Gentileschi had a profound effect on the quality of his work and focused the inspiration he experienced as a child. After years of learning the techniques of the old masters, Eric honed his skills at the Philadelphia studio of renowned international realism artist and portrait painter Nelson Shanks, Studio Incamminati. In 2003, Eric was selected to represent the United States in Florence, Italy at the Biennale Internazionale Dell Arte Contemporanea where he exhibited several of his paintings. 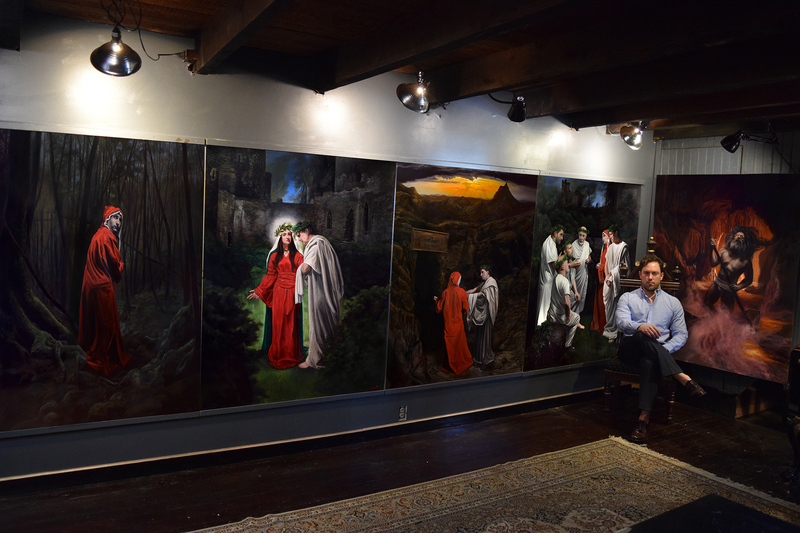 Today Eric's paintings have established him as one of today's strongest purveyors of traditional figurative painting. Eric has been a finalist in four Art Renewal Center International Salons and has won the Chairman's Award for the Sixth International Art Renewal Center competition out of 1700 submissions from over 30 countries worldwide. In 2015 Eric's work was selected as a finalist for the Figurativas International Painting Competition in Barcelona, Spain. His painting was in the top 5% out of 2500 entries from 90 countries. In 2015 Eric was recognized by the Art Renewal Center as an Associate Living Master. Eric is an artist ambassador for Jerry's Artarama Art Supplies and is regularly featured in their Artist Spotlight series. Eric conducts several workshops in his studio on traditional painting each year and has attracted students from around the world that come to study with him. Eric's work has been featured in such galleries and museums as the Salmagundi Art Club and the National Arts Club in New York; Allentown Art Museum; Philip and Muriel Berman Art Museum, Ursinus College; Monsoon Galleries; Hoyt Institute of Fine Arts; State Museum of Pennsylvania; and Reading Public Museum to name a few. His paintings are in the permanent collections of Howard Tullman, The Trenton City Museum, The National Shrine of Czestochowa USA, Lehigh Valley Hospital and numerous churches private collections worldwide. His artwork has been prominently featured in The New York Times, Wall Street Journal, Chicago Tribune, American Artist Magazine, American Art Collector, Fine Art Connoisseur, The Huffington Post, Victorian Homes, and Old House Journal. Want to Learn More about the Twisted Olive Featured Artists?